Regardless of whether you’re painting an interior wall, a ceiling, a fence, kitchen cabinets, furniture or the outside of your house, finding the best paint sprayer to do the job is one of the keys to obtaining an outstanding finish and making you look like a professional. Even if you’re a professional painter, owning the right paint sprayer means you will paint easier and faster with perfectly smooth results, saving time and making your clients satisfied. However, like many other seemingly simple tools, paint sprayers actually come in distinctive flavors and varieties. For those who do not have extensive experience working with paint sprayers, this variety can be intimidating and confusing. This handy guide is designed to help make your choice easier. We would also like to show you our picks for the best paint sprayers on the market, including airless paint sprayers, HVLP paint sprayers, handheld paint sprayers, with detailed reviews. Of course, by reading our reviews, you might not have to spend as much as you think! There are many benefits of using an electric paint sprayer instead of a roller or paint brush. The most obvious advantage is that painting with a paint sprayer is MUCH FASTER than using a brush or roller. Paint sprayers are very useful for painting large areas quickly. A good airless paint sprayer can do the job up to 10 times faster than using a brush and up to 4 times faster than using a roller. Simply put, paint spraying is the fastest way to paint a house or furniture. Paint sprayers able to cover rough or uneven surfaces and get into those hard to reach places, like textured walls, popcorn-effect ceilings, windows, corners, or office chairs – where paint rollers and brushes can’t easily access because of their shape. If you try to force the roller in those places, you will likely end up with scratches on the surface or splotches of wet paint. Instead, you can eliminate this problem by using a paint sprayer, designed to spray a fine mist to get to hard-to-reach areas. Paint rollers don’t always offer a smooth finish in the end. However, a sprayer does because paint particles form a fine mist, covering all surfaces it touches. This aspect of paint sprayers makes it attractive for spraying paint or stains on cabinets, furniture, and window frames. It is also much easier to produce a thin coat with a paint sprayer than it is with paint brushes and paint rollers. Plus, modern airless paint sprayers and HVLP paint sprayers are adjustable, you can control the spray area much easier than conventional paint sprayers, so there can be less overspray. But make sure you choose the right type of paint sprayer for your job. Airless paint sprayers are best for painting wall, fences, and ceilings, while the best paint sprayers for painting home furniture and kitchen cabinets are HVLP paint sprayers. Some people are afraid of using a paint sprayer for a small project because preparing and cleaning up a paint sprayer can be a time-consuming process. But there is one kind of paint sprayer on the market that is designed to be cleaned up in seconds and are perfect for small jobs – handheld airless paint sprayers, such as the Graco Ultra Cordless Airless Handheld Paint Sprayer. These airless handheld sprayers are designed specifically for small interior or exterior projects. They take only a few seconds to clean up and can easily be transported from room to room, job site to job site. What Type of Paint Sprayer is Best For You? When selecting a paint sprayer, the most important thing you’ll need to consider is finding the right type of paint sprayer for your painting needs. There are basically about two main different types of paint sprayers that most homeowners and professional painters are using today: Airless Paint Sprayers and HVLP Paint Sprayers. We will discuss each type in detail in order to help you decide the best type of paint sprayer for your specific task. 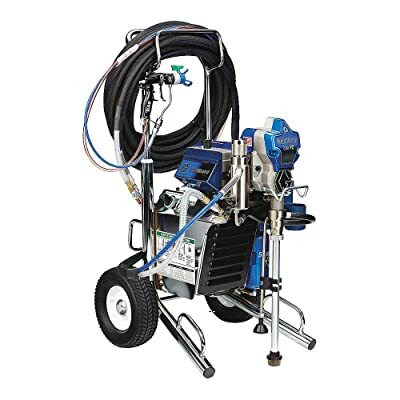 Airless paint sprayers, such as the Graco Magnum 262800 X5, are the most common type of paint sprayer on the market. Airless paint sprayers are best for large painting jobs such as painting the exterior of your house, interior walls, and ceilings, bedrooms, living rooms, garage doors, fences, or other rough surfaces. These are what contractors use to paint a new build. They work exceptionally well with Latex based paints that are commonly used to paint homes. Airless paint sprayers require little setup and cleaning time and produce a professional-looking result even on surfaces that are hard to paint using a traditional brush. An airless paint sprayer is a system that atomizes (breaks up) paint and other coatings into small droplets without using compressed air. It pumps these fluids under high pressure from a paint pail through the sprayer, hose, spray gun and spray tip onto a wall or ceiling. In airless spray, the fast-moving high-pressure liquid stream provides the energy necessary to overcome the fluid’s viscosity (resistance to flow) and surface tension (a force that bonds the surface of a liquid together) to form a fine spray. In the depiction of spray from a gun, high pressure forces fluid through a spray tip. The fluid emerges as a solid stream (sheet) at a high speed. When the solid stream hits the air, it becomes disrupted. This disruption breaks the fluid into fragments initially, then ultimately very small droplets that form the spray pattern. The spray tip is one of the most important components of an airless spraying system. The tip determines the amount of material the sprayer applies (flow rate) and the width of the spray pattern. Together, the tip size and pressure setting determine how much latex paint flows through the sprayer onto the wall or ceiling. Lacquers, stains, enamels and other light coatings can be sprayed with small tips, while latex paints are heavier and require a tip with a larger orifice. The best airless paint sprayer for you should support the tip sizes you want to use. Cup sprayers are a type of handheld airless paint sprayers. They are compact, cost less, and are the best paint sprayers for garage doors, room doors, fences, decks, shutters, outdoor furniture, or other smaller home DIY projects. They can also be used for small touch-ups on larger projects. Paint thinning may be needed for cup sprayers. The handheld sprayers are similar to a traditional airless sprayer where they have a gun and pump built into the sprayer. The only major difference is that a handheld sprayer does not have an airless hose, making it easier to startup, less wasted material and easy to clean for small jobs. Below is the Wagner Power Painter Plus Cup Sprayer. Air-assisted airless sprayers are another type of airless paint sprayer. Air-assisted airless sprayers offer fine finish capabilities combined with a medium production rate. Air-assisted technology uses a combination of airless and air spray. Fluid pressure ranges from 700 to 900 PSI, with air intermixed at 15 to 30 PSI. The systems typically are found in stationary and portable fine finish production applications. Transfer efficiency for air-assisted airless ranges from 40 to 65%. Air-assisted airless units are powerful but expensive and not really portable. 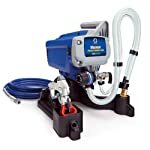 Below is the Graco 395 FinishPro II Fine Finish Air-Assisted Airless Sprayer. Airless spraying is the fastest way to paint your house. They work with high pressure which makes them perfect for painting large areas. And since an airless paint sprayer pumps paint directly from a can or bucket, you can apply a lot of material in a short time. This makes an airless paint sprayer particularly well suited for large paint jobs, like priming bare drywall in a new house or painting a 300-ft.-long privacy fence. In addition, airless paint sprayers are available in many flow rates. From small handheld electric sprayers, like the Wagner Power Painter Plus that sprays 6.6 gallons per hour, to heavy-duty commercial airless paint sprayers, like the Graco Pro210ES Cart Pro that disperse up to 47 gallons per hour. So it’s very easy to choose the model that is suited to the size of your project. At least 10 times faster than brush applications. Airless paint sprayers can be used for a wide range of coating materials, including interior and exterior walls, ceilings, windows, doors, and can handle thicker paints than compressed air or HVLP paint sprayers. Airless paint sprayers are also effective at penetrating difficult-to-reach cracks and other uneven surfaces. Coats of paint applied by airless sprayers tend to adhere extremely well to the painted surface, which means that users must do less painting in the long run. When used correctly, airless paint sprayers produce a high-quality finish – completely atomized and evenly distributed – on most types of surfaces, especially the surfaces that require moderate masking and rarely have a need for thinning paint. But remember, if you are painting with paint other than latex and smaller articles that have to pass a close-up inspection, such as painting kitchen cabinets or living room furniture, you may want to consider the use of an HVLP sprayer. In this case, even the best airless paint sprayers on the market can’t do a better job than with a regular HVLP unit. Airless paint sprayers operate at extremely high pressure. If your finger (or any part of your body) gets too close to the tip, paint can be injected under the skin. The other downside is the extra time it takes to flush the paint from the pump and hose and clean up the spray gun. You’ll also have to clean the filters and install special storage fluid. HVLP (High-volume, Low-pressure) paint sprayers, such as the Fuji Mini-Mite Platinum 4 HVLP Spray System, are perfect for the fine finish woodworking. HVLP paint sprayers are the best paint sprayers for painting kitchen cabinets, interior furniture, or any other surface that requires a very smooth finish. If you’re a professional cabinetmaker, or furniture builder, look no further than an HVLP spray system. How Does an HVLP Paint Sprayer Work? An airless paint sprayer produces very high pressures and blasts the paint to the surface. The result is excessive atomization and the paint actually bounces off the surface, producing large amounts of waste called overspray. This causes the need for excessive masking and covering. An HVLP paint sprayer, instead, consumes higher volume air (10-25 CFM) at a lower pressure (2-10 PSI) to atomize coatings. By reducing atomizing air pressure at the air nozzle, forward velocity of the spray is also reduced, minimizing “bounce back” and “overspray” from the article being coated. This results in substantial savings in coating materials, booth filter usage, and helps industrial finishing operations meet compliance regulations. HVLP gives a higher transfer efficiency rate than any other spray system. Some of the best HVLP paint sprayers have transfer efficiency rates of up to 90 percent or more, which means 90 percent of the spray actually ends up where it is intended. Giving you a cleaner environment that needs less masking. An HVLP paint sprayer can be used to apply many different types of primers, paints and clear wood finishes. The best types for this paint application system are alkyd primers and alkyd finish paints. Clear wood finishes include varnish, lacquer and acrylic urethane. Oil-based finishes are the easiest to spray giving the best results. Even interior wood stains can be applied with this sprayer. An HVLP can be used with latex paint to use in a small project. But for a large project like painting house, the best paint sprayer for latex paint is always an airless unit, as it requires fewer preparation efforts and gets the job done way faster. Fine Finish – No other spraying method will provide this amount of control. The amount of material and air can be controlled with great precision producing an ultra smooth factory-like finish. Easy to Use – The paint is applied slowly and in thinner coats. This gives you greater precision. Using an HVLP paint sprayer is simple, requiring just a little practice. Most commonly found HVLP systems on the market are the turbine HVLP spray system. This is the best HVLP paint sprayer type for most contractors and woodworkers. Turbine HVLP paint sprayers are light and compact, the portable design allows them to be used on any job site. The main downside of HVLP paint sprayers is that they gain efficiency at the cost of speed. In other words, they are slow. How slow? As a rule of thumb, HVLP paint sprayers are best suited for projects no larger than the size of a door. This type of sprayer is definitely too slow for major projects, such as painting a fence or an entire room. The pressure settings of an HVLP spray system can be adjusted – but they cannot be increased beyond the maximum limit of 10 PSI. This maximum limit is low so certain materials require more preparation with HVLP systems. In order for higher viscosity materials to be applied properly, they must be diluted. HVLP vs. Airless Paint Sprayers – Which is Best for You? Airless paint sprayers are the most powerful type of paint sprayer on the market. 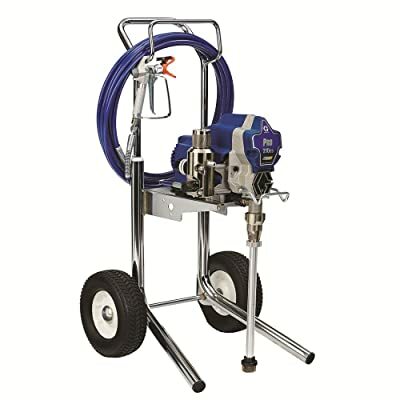 This type of paint sprayer is perfect for large, heavy-duty projects. They are the best paint sprayers for painting entire the house, exterior/interior walls, ceilings, doors, windows, decks and fences, and hard-to-reach spots. They are perfect for latex-based paints. For readers that have lots of large painting jobs that require industrial-grade quality and durability, airless paint sprayers deserve close consideration. Handheld airless sprayers or cup sprayers are designed for small to medium projects. They are cheap and portable. HVLP paint sprayers are ideal for precision projects. They are more accurate and efficient than airless paint sprayers, but HVLP sprayers are also much slower, in comparison. HVLP paint sprayers are the best choices for painting cabinets and furniture and anything that requires an excellent smooth finish. When accuracy counts the most, you should take a close look at this type of paint sprayer. The Graco Magnum X5 suits the needs of most DIY homeowners who want to get cost-efficient, high-speed performance airless paint sprayer. It’s capable of spraying most household interior and exterior with latex paints. It’s ideal for painting walls, ceiling, decks, siding, fences, and small to mid-sized houses. It can do just about anything you want. The Magnum X5 is lightweight and portable. It’s designed to be easy to carry and supports up to 75 ft. of paint hose, giving you the ability to spray every corner of your house. You can spray directly from a 1 or 5 gal. bucket with its flexible suction tube. This sprayer is designed to spray up to 125 gallons per year. The core feature of the Magnum X5 and other models in the Magnum series is Graco’s exclusive TrueAirless technology. This technology delivers the ability to spray unthinned material – as intended by the paint manufacturer – and achieves the most consistent spray pattern for one-pass coverage. Simply put, this technology can bring your house a beautiful look like it was painted by a professional painter. 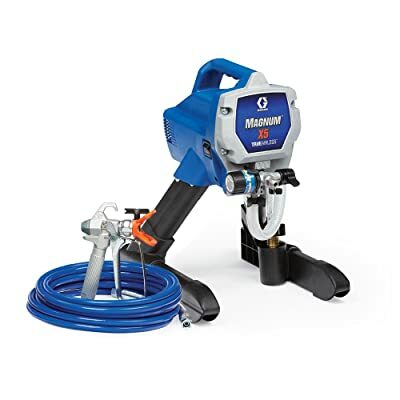 Overall the Graco Magnum X5 is our pick as the best paint sprayer for most DIY homeowners. It’s fast and efficient and instructions are developed to make it easy to use and take care of. Supports up to a maximum tip size of .015 in. The Magnum X5 delivers 13% more performance than the Graco Project Painter Plus. While the Graco Magnum X7 delivers 15% more performance than the X5 and supports larger tip, up to 0.017 in. for spraying heavier coatings. The Graco Magnum Project Painter Plus paint sprayer is the sprayer that is designed for a large project or maybe a couple. It’s designed to do what the bigger ones can do but just not as long or as often. 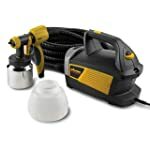 This sprayer is made to be cost-effective so it won’t last forever, so if you’re looking for a paint sprayer to spray latex paint either interior or exterior of your house for just one or two jobs and then you hope to never paint again, then this would be the best budget paint sprayer for you. 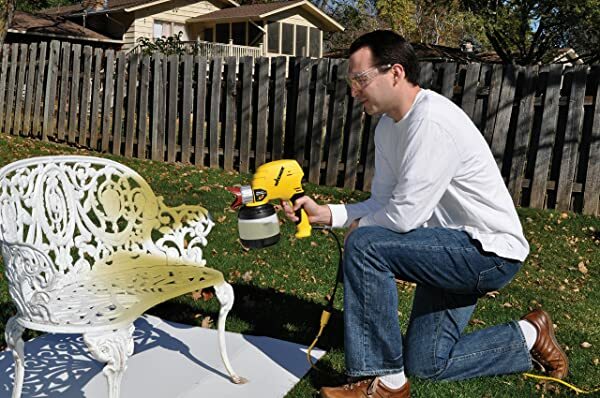 The Magnum Project Painter Plus is amongst the cheapest electric airless paint sprayers on the market, and it has been a preferred choice of many DIY homeowners, who want to give their houses a fresh, updated look but don’t have much money to spend. Painting on your own will obviously save you quite a bit of money, as the only things you will need to purchase an airless paint sprayer and the supplies to complete the job. This Graco’s paint sprayer will help you get the job done much faster and easier, and keep the overall cost as low as possible. 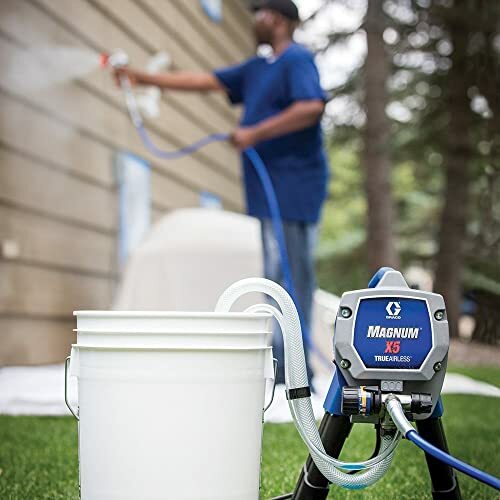 Overall, the Graco Magnum Project Painter Plus is the best airless paint sprayer in its price range. This airless paint sprayer is affordable, and easy to set up, use, and clean up. It is ideal for painting most of your indoor projects or tackling outdoor home improvement projects, such as ceilings, sheds, decks or fences. Stable, low profile with integrated pail hook so everything can be carried together. 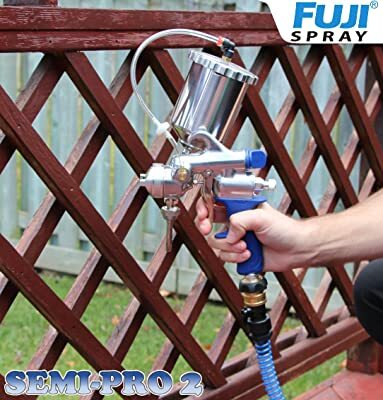 If you’re looking for a small electric airless paint sprayer to complete your outdoor DIY painting and staining projects, like garages, pergola, fences, overhangs, playsets, sheds, and outdoor furniture, this is a perfect choice. The Wagner Power Painter Max speeds up outdoor painting projects with fast coverage and even spray. This cup sprayer features EZ Tilt Technology that allows you to spray at any angle without spitting or stopping. You can point down at floors or decks, and up at ceilings and always maintain a continuous flow of material. With the EZ Tilt system, the suction tube is free and uses gravity. So when you are spraying overhead, the gravity makes the paint seek the lowest position in the cup, but the suction tube does the same thing so you always have a suction. A couple other cool features this airless paint sprayer has is the low-level paint indicator and speed control. With the speed control, a user can select wide or narrow patterns. The painter comes with a 1-1/2″ quart cup or you can hook this system directly into a paint can using the included paint can lid and the suction hose. A user can also select between paint and stain with a movable switch, providing complete control for spraying stains, sealers, oil paints, and latex paints. Overall this is one of the best spray guns for small outdoor projects. It can be a bit loud for indoor painting but for outdoor it’s great. If you hate painting, this Wager will make it much easier or more fun. Electronic controls can be adjusted to match desired painting speed and project size. The Titan Impact 440 Airless Paint Sprayer is the best airless paint sprayer for commercial applications. If you’re a painting contractor who routinely handles large residential projects, property maintenance, and small commercial buildings, you need an airless sprayer that will deliver the best in performance and reliability, and you need a sprayer that can be used daily or weekly at an affordable cost, then this is your unit. Graco Pro210ES Cart airless paint sprayer is also a great option to buy if you are a professional painter. This unit delivers an excellent performance and also has a bit lower price compared to the Titan. We would say both are two of the best paint sprayers for professionals on the market for painting interior and exterior. 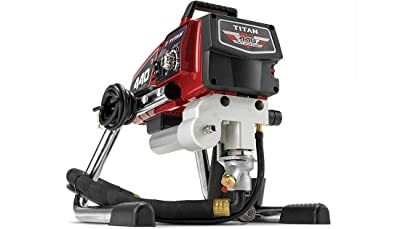 But on commercial applications, we found the Titan Impact 440 is much more reliable, stronger and faster, easier to maintain, and less fussing with clogging and spitting when running the entire day. You can run this commercial airless paint sprayer all days every day without any problem. Plus, the Titan Impact 440 is designed to consistently spray 50-100 gallons per week, while the Graco Pro 210ES is about 30-50 gallons per week. And if your work is painting a bedroom, a living room, or exterior walls that need to change colors fast, you’ll love the Titan. Titan Impact 440 can spray stains, lacquers, enamels, latex, and other low and medium viscosity coatings. It supports up to a .023 in. maximum tip size, up to 100 ft of paint hose. It shoots 0.54 gallon per minute at up to 3300 psi. This electric paint sprayer features Quad+ Packings which is designed to wipe abrasive coatings clean during operation, preventing damage to the piston or the main sealing lip. The Sureflo Pusher Valve lets you release a stuck lower ball valve without using a hammer. With the AutoOiler, you simply push button to deliver oil from the reservoir directly to the packings. All in all, the Titan Impact 440 is one of the best commercial paint sprayers money can buy. It works like a champ and gets the job done fast. It’s a must-have for professionals! 7/8 HP motor, 37 pounds, 3300 PSI, 0.54 GPM. 0.023” maximum tip size. Quad+ Packings – designed to wipe abrasive coatings clean during operation, preventing damage to the piston or the main sealing lip. AutoOiler – with the push of a button you deliver oil from the reservoir directly to the packings. The Graco Ultra Cordless Airless Handheld is a battery-powered airless paint sprayer designed specifically for small interior, exterior and specialty projects. It’s easy to set up, lightweight, powerful and super convenient to use. It’s the perfect spray gun for turning over a small project or difficult areas to paint like lattice or shutters. This cordless sprayer is powered by a DeWalt XR 20V 2A lithium-ion rechargeable battery – this battery is used in many Dewalt’s cordless power tools, such as impact wrenches, drills, jobsite radios, sliding miter saws, air compressors and more. This battery is reliable and known for delivering long run time with quick charge. The sprayer can spray up to 1 gallon of paint per charge, and it comes standard with 2 batteries. For a longer runtime, you could use a DeWalt 20V 6-9A battery. The Graco Ultra Cordless Airless Handheld cordless sprayer is designed to paint Primer, Stains, Water-Based Paint, Acrylics, Enamel, and Latex. It supports It has three settings – professional finish, fast or slow – allow users to spray at the speed they choose. It also features ProControl II – allows you to adjust motor speed (500 psi to 2,000 psi) to spray at speed that the job demands. The spray gun supports .008-.016 tip. Overall, if your projects require an airless paint sprayer with ultimate portability, this is one of the must-have tools. The Graco Ultra Cordless Airless Handheld is also ideal for small DIY projects around your house. 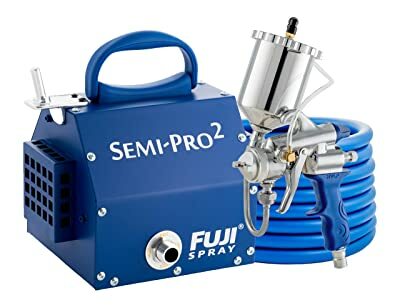 In this section we will be reviewing some of the best paint sprayers for painting furniture and cabinets, most of these units are HVLP sprayers. An HVLP paint sprayer delivers the ultimate control for fine finish jobs. By using a turbine to generate a high volume of air to atomize the coating there is less overspray and a higher transfer rate to deliver precision and flexibility — ideal for small coating amounts and surfaces requiring detailing. Fuji Spray SEMI-PRO 2 offers you the perfect combination of versatility and performance to lay down that professional-looking finish. Considered the go-to system for both workshops and home use, the SEMI-PRO 2 is ideal for spraying kitchen cabinets, interior furniture, trims, doors, shutters, fences and so much more. This HVLP system is designed serious hobbyists and semi-professionals and stacked with features not found on any similar priced systems. Powerful 1400 watt motor provides enough power to spray most types of materials. The system has a durable metal turbine case sits on 4 rubber feet. Modular power cord. M-model gravity spray gun has all the professional features. Non-bleed for less blowing around of shop dust and overspray. Pattern control knob to adjust the fan size from small round to large vertical or horizontal fan. Insulated handle never gets hot. 400cc gravity cup. The SEMI-PRO 2 is also the most powerful 2-stage system on the market. What are HVLP turbine sprayer stages? HVLP turbine sprayer stages are really the number of fans inside. The fans serve to increase the air volume and pressure supplied to the HVLP turbine paint sprayer. Fan stages can range from single or two-stage up to 6 stages or more. The number of stages is really a reflection of the power. As a rule of thumb, the more stages, the more power. Personally, we think a 2-stage unit will be enough pressure to handle almost any type of coating, it’s the best choice for most serious hobbyists and DIY enthusiasts. But if you’re a professional carpentry or cabinetmaker, or if you’re going to spray latex occasionally, the best paint sprayer for you should have at least 3 stages. And if you’re going to spray latex a lot, you’ll want to look at the 4-6 stages units. Overall, the Fuji Semi-PRO 2 Turbine HVLP spray system earned our first spot for the best HVLP paint sprayer for DIY/hobbyist. This unit is durable, easy to use, gives you clear finishes and stains, and allows you to spray quite often. No other HVLP system in this price range comes even close to matching the quality and features of this system. If you’re a professional woodworker or cabinetmaker on-the-go looking for a spray system with enough power and portability for your fine-finishing projects, the Fuji Mini-Mite 4 PLATINUM is a must for your business. This HVLP system with its 4-stage motor produces approximately 8.5 psi – giving you enough power to handle any type of coating, allowing you to spray kitchen cabinets, small furniture, autos or pianos. It is much more powerful than the Semi-PRO 2 – providing enough power to spray all known coatings when thinned properly, latex coating, all newer water-based coatings, oil-based coatings, and some of the heavier coatings. 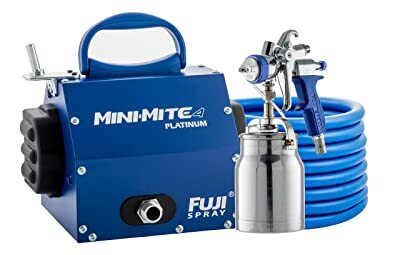 Another key feature that makes the Mini-Mite 4 Platinum one of the best HVLP systems for professionals is it comes with the Fuji T-Model HVLP Turbine Spray Gun. This spray gun was designed to meet the rising demand for a spray gun that offers the ultimate in flexibility and control. Combined with a new sleek design that is ergonomic and well balanced. This spray gun also features a Side-Mounted Fan Pattern Control to adjust the size of the fan from small to large. This control allows the operator to switch from a circular to oval pattern and anywhere in between. Unlike traditional HVLP turbine spray guns with the front collar adjustment, the Side-Mounted Fan Pattern Control offers full incremental fan size throughout the whole range. Located on the left side of the spray gun for convenience, it is easy to adjust: turn counter-clockwise for a smaller pattern and clockwise for larger. In the Platinum series and Platinum Q series, Fuji Spray has designed a unique method of removing any heat build-up from the Turbine case. Excess heat is channeled to a Heat Dissipation Box located at the rear of the case. Because the hot air is dissipated evenly through an optimum surface area with 60 holes, there is no added hiss or loud whistling noise. There is also no blowing around of dust. The benefits of a cooler running unit result in a longer life for your turbine motor compared to standard turbines. The Mini-Mite 4 Platinum does not have the patented noise-reduction feature as seen on the Fuji Q-Models, however, the noise level is no more than any other standard HVLP turbine. In terms of power, they are the same. Again, the Fuji Mini-Mite 4 Platinum is one of the best paint sprayers for furniture and cabinets. If you’re a professional, you’re on the road and throwing your sprayer into the back of a truck, you have employees and you’re on a construction site, this unit is for you. 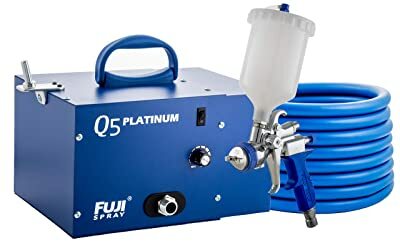 Now, it’s time to look at one of the most desirable HVLP spray system in the world – Fuji Q5 Platinum Quiet 5-Stage HVLP Spray System. This ultimate system is specifically designed for professional spray finishers, cabinetmakers, woodworkers, or for those who simply want the best all-around spray experience. It allows you to focus on what really matters – the quality of your work! The Q5 is the most powerful unit in the Q series. 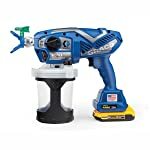 It features a 5-stage turbine motor develops approximately 9.5psi, making it perfect for fine-finishing of cabinets, furniture, as well as heavy painting projects. It’s more than enough power to handle any type of coating or material, waterborne and solvent-based coatings, oil-based paints, interior latex paints, and some much heavier coatings. And if you’re spraying a lot of latex, this is the best paint sprayer for you. At 15ft, the Fuji Q5 generates only about 63 dba, and at 20ft it is 60 dba. Compare this to a standard turbine at 79 dba from 15ft and 77 dba from 20ft. A normal conversation is rated at 60 dba. The Q3 and Q4 are even 1dB quieter. To do that, Fuji Spray has reduced turbine noise levels by over 50% without causing any unwanted challenges, such as overheating through air restriction. Fuji Spray does not surround the turbine motor with soundproofing material, but rather uses a method that allows the turbine motor to sit in an all-metal enclosure the way that standard turbines do. The Q series turbines have computer-designed airflow configurations that completely eliminate ‘direct sound paths’ found on low- to mid-priced HVLP turbine systems available today. These direct sounds paths, or DSP’s, are responsible for the noise. In fact, when the Q series turbine is placed across the room, the low hiss of air passing through the spray gun when the trigger is engaged is more noticeable than the turbine. So, if you’re a full-time cabinetmaker or professional carpentry, you have a smaller shop with neighbors (or have employees working in the same area), this is a perfect choice. Another key feature is the Variable Speed Control Dial (only available in the Fuji Q5 Platinum system) that offers you the ability to adjust the output pressure to the optimum adjustment needed to perfectly atomize your coating. This is achieved by introducing the correct amount of air to the fluid stream reducing overspray/ bounce-back and dry spray to an absolute minimum. Other features of the Q5, including the Heat Dissipation Box, Gravity Spray Gun, Fan Pattern Control, and 25ft hose are as similar as the Mini-Mite 4. Overall, this unit is not cheap, in fact, it’s one of the most expensive HVLP spray systems on the market. That’s because it’s built to last, to be used every day, to deliver only the best to the end users, and to meet the needs of the serious professionals. If you have extra money to spend, this is a complete no brainer. Variable Speed Dial – controls motor speed, allows the operator to make adjustments to the pressure output based on the coating being sprayed. The Wagner Control Spray Max is one of the best paint sprayers for beginners, or those looking for an affordable HVLP spray system for painting doors, windows, trims, outdoor furniture, and other smaller DIY projects. And if you do mostly clear finishes and stains, all you really need is a 2-stage unit like this one. With a 2-stage turbine, this system produces 2.6 psi. 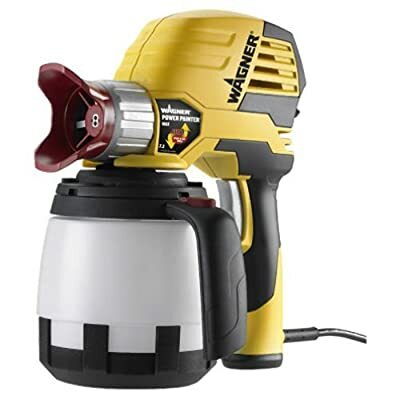 It has a variable air pressure control (1.50-2.63 psi), a metal spray gun, and a 20-foot flex air hose to extend your reach. It also includes two air filters that protect the finish from dust, a 1-quart, contractor-grade viscosity cup, and a larger 1-1/2 quart plastic cup. This cheap HVLP paint sprayer is ideal for thin materials like vanishes, lacquers, and stains. It will spray latex paints but need to be thinned properly. We’d recommend you look at another unit with a bigger turbine if you want to spray thicker materials and bigger jobs. And for painting the interior or exterior of a house, consider an airless paint sprayer. Anyway, the Wagner Control Spray Max is still one of the best budget HVLP paint sprayers available to buy. In addition to an affordable price, it’s also lightweight, easy to assemble, control, and clean up. At its price point, it’s a fantastic value and a quality tool.